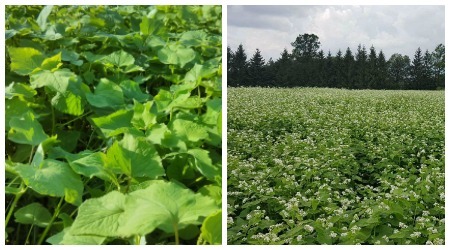 This year at Mapleton's, we are trying buckwheat for the first time on two small plots totalling about 5 acres. One of these plots is between the pumpkin patch and the cedar hedge maze to prepare the field for strawberries. As you can see from the pictures below taken in June it's actually a very leafy plant, quite different than what many people think of in terms of "wheat". Buckwheat is not a grain and is from a totally different plant family than wheat. Wheat is a member of the grass family and only flowers and sets seeds once. Buckwheat is an undetermined flowering crop, which means it has a longer continuous flowering cycle. 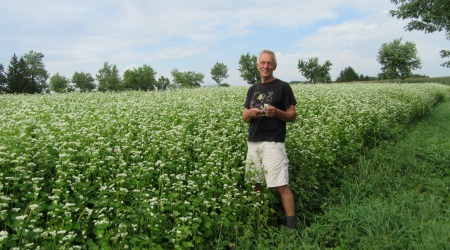 Here is Martin in the same field of buckwheat, but in August. It grows thick and fast, choking out weeds. 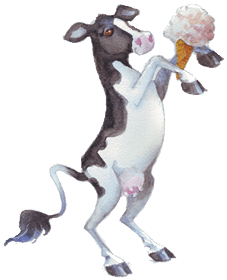 It can be combined to harvest the seed which can be sold; or it can be simply ploughed under. It is able to dissolve and use unsoluble phosphorous in the soil. 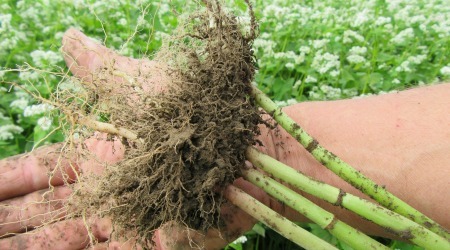 After harvest or being ploughed under as a 'green manure crop', the buckwheat plant decays and the phosphorous in the plant is now available in the soil in a soluble form for the next crop. As well, it adds organic matter to the soil. It can be hard to control because it grows aggressively and because it is usually a prolific producer of seed. Because buckwheat has a longer continuous flowering cycle this means that if it is harvested for seed, a lot of seed may have already matured and dropped to the ground before the harvest. And regardless, during swathing and combining seed will drop as well. Below is a picture from early August. On the left you can see the white blooms. In the close up on the right you can see the seeds forming which are a dark red pink colour. 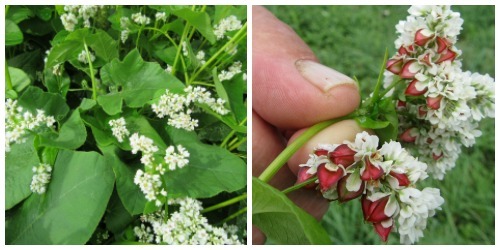 Pollinators are needed to pollinate the buckwheat flowers to create seed. Compared to other crops, especially canola, buckwheat is not as appealing to pollinators. If there is a canola crop nearby blooming at the same time as the buckwheat, the pollinators would be drawn to it rather than the buckwheat. We are curious to see what the seed rate will be in the two different plots. One is near beehives, the other not. 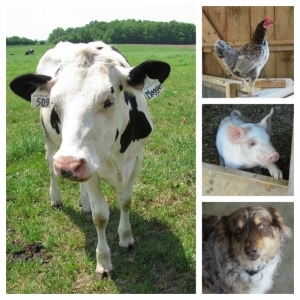 It doesn't fit into the crop rotation at Mapleton's very well, and perennial forages such as alfalfa or grasses, or annual crops such as oats are preferred over buckwheat. It will likely be mid to late September when the buckwheat will either be swathed and combined for seed, or alternatively ploughed under.